You will be able to create your Email using Email Accounts options in Cpanel hosting plans. HostingRaja is the best web hosting company India with Cpanel. It offers Cpanel as a control panel to run your hosting account. In any of the shared hosting plans you purchase from HostingRaja you get Cpanel as your control panel. Our team members will provide the best support for all the Cpanel. In this page, we will discuss how to create and manage email accounts. 1) Email: Need to enter the email address which you want to create. And, you can select only from domains, which are associated with your accounts like the primary domain, addon, and parked domains. 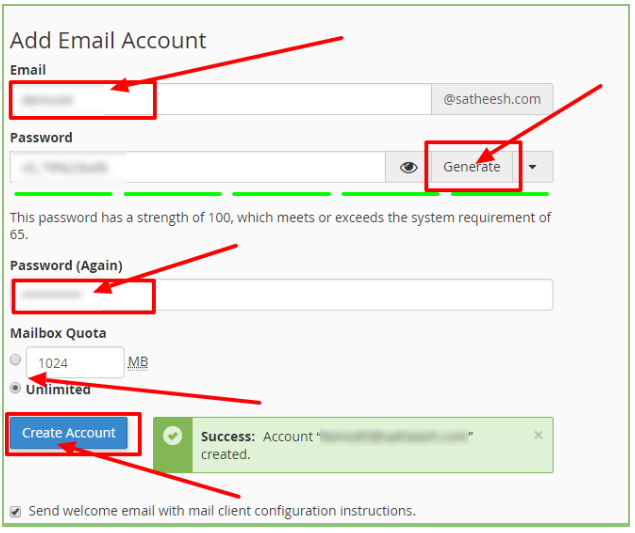 2) Password - Need to select a powerful password for your brand new email account. The password strength box will help you in making it more secure. 3) Mailbox Quota - Select the size of the mailbox. Moreover, different plans have a different size of a mailbox. There will be a note with the given limit above this field. Step 1: To access an existing email account or to access which is created. You will find the Email Account option once your email id is been registered. http://ServerIP:2095 - with http and your IP address. The mail client feature allows Users to configure the Email account in Email clients such as Thunderbird, Outlook, Apple Mail etc. You can either configure the Email client manually or automatically. Step 1: In email accounts >> click on more option next to the mail id >> Click on “Connect Devices” option corresponds to the Email account. Note: It is recommended to use SSL/TLS while configuring mail client. If you need any assistance in Creating and Managing Email Accounts feel free to contact our technical team members as they are available 24/7 via phone call, email, ticket system or call out toll-free no 1800-123-8642. How to Create an Email Account Forwarder? How to Create and Manage Subdomains? How to redirect your website?